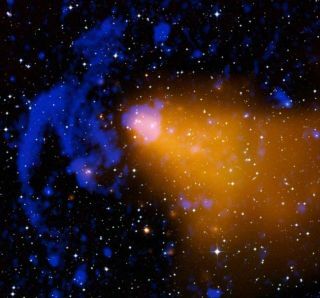 This composite image of the galaxy cluster Abell 3376 shows X-ray data from the Chandra X-ray Observatory and the ROSAT telescope in gold, an optical image from the Digitized Sky Survey in red, green and blue, and a radio image from the VLA in blue. Two new studies that put Einstein's General Theory ofRelativity to the test proved that even after 95 years, there's no messingwith Albert. The pair of independent studies each used observations fromNASA's ChandraX-ray Observatory to test Einstein's theory of GeneralRelativity, and to study the properties of gravity on cosmic scales. Both demonstratedthat Einstein's theory continues to hold true almost a century after it wasfirst published. Each team of scientists took advantage of extensive Chandraobservations of galaxy clusters, which are cosmic formations that can containanywhere from 10 to thousands of galaxies. These clusters are the largestobjects in the universe bound together by gravity. Galaxy clusters are important objects that help researchersunderstand the universe as a whole. Because the observations of the masses of galaxyclusters are directly sensitive to the properties of gravity, they can providecrucial information. The results of one study undercut a rival gravity model thatchallenged General Relativity, while the other showed that Einstein's theory isapplicable over a vast range of times and distances across the cosmos. General relativity rocked the world of physics when Einsteinfirst published his paper on the subject in 1915. The theory built on the traditional idea ofgravity based on Isaac Newton's laws, but added fundamentally new conceptslike the notion that mass deforms the shape of space-time. This means thatobjects and even light that move through space near a large mass will travel ona curved path. Furthermore, it means that mass can stretch or shrink time aswell. The first new study's findings significantly weakens acompetitor to General Relativity known as "f(R) gravity." "If General Relativity were the heavyweight boxingchampion, this other theory was hoping to be the upstart contender," saidFabian Schmidt of the California Institute of Technology in Pasadena, Calif.,who led the study. "Our work shows that the chances of its upsetting thechamp are very slim." In recent years, physicists have focused their attention oncompeting theories to General Relativity as a possible explanation for theaccelerated expansion of the universe. Currently, the most popular explanation for the accelerationis the so-called cosmological constant, which can be understood as vacuumenergy that exists in empty space. This energy is referred to as darkenergy to emphasize that it cannot be directly detected. In the f(R) theory, the cosmic acceleration does not comefrom an exotic form of energy, but instead, from a modification of thegravitational force. This modified force also affects the rate at which smallenhancements of matter can grow over the eons to become massive clusters ofgalaxies, opening up the possibility of a sensitive test of the theory. Schmidt and his colleagues used mass estimates of 49 galaxyclusters in the local universe from Chandra, compared them with theoreticalmodel predictions and studies of supernovas, the large-scale distribution ofgalaxies, and the cosmicmicrowave background, which is a form of electromagnetic radiation thatfills the universe. The researchers found that gravity on scales larger than 130million light-years is no different from Einstein's geometric theory ofgravitation. "This is the strongest ever constraint set on analternative to General Relativity on such large distance scales," saidSchmidt. "Our results show that we can probe gravity stringently oncosmological scales by using observations of galaxy clusters." The findings of the other, separate study bolstered Einstein'stheory by directly testing it across cosmological distances and times. Until now, General Relativity had only been verified usingexperiments from laboratory to solar system scales, leaving some to believethat the principles of General Relativity could break down when applied to muchlarger scales. A research team at Stanford University compared Chandraobservations of how rapidly galaxy clusters have grown over time to thepredictions from General Relativity. They found that the Chandra observationswere in almost complete agreement with Einstein's theory. "Einstein's theory succeeds again, this time incalculating how many massive clusters have formed under gravity's pull over thelast five billion years," said David Rapetti, who led the study at theKavli Institute for Particle Astrophysics and Cosmology at Stanford University. "Excitingly and reassuringly, our results are the most robust consistencytest of General Relativity yet carried out on cosmological scales." Rapetti and his colleagues based their results on a sampleof 238 galaxy clusters that were detected across the whole sky by thenow-defunct ROSAT X-ray telescope. These observations were enhanced by detailedmass measurements for 71 distant from Chandra, and 23 relatively nearbyclusters again using ROSAT. Data was combined with studies of supernovas, the cosmicmicrowave background, the distribution of galaxies and estimates of thedistance to galaxy clusters. Observations of supernovas or thedistribution of galaxies measure cosmic distances, which depend only on the expansionrate of the universe. In contrast, the cluster technique used by Rapettiand his colleagues also measure the growth rate of the cosmic structure, asdriven by gravity. "Cosmic acceleration represents a great challenge toour modern understanding of physics," said Rapetti's co-author Adam Mantzof NASA's Goddard Space Flight Center in Maryland. "Measurements ofacceleration have highlighted how little we know about gravity at cosmicscales, but we're now starting to push back our ignorance." The paper by Fabian Schmidt was published in Physics Review D, Volume 80 inOctober 2009 and is co-authored by Alexey Vikhlinin of the Harvard-SmithsonianCenter for Astrophysics in Cambridge, Massachusetts, and Wayne Hu of theUniversity of Chicago, Illinois. The paper by David Rapetti was recentlyaccepted for publication in the Monthly Notices of the Royal AstronomicalSociety and is co- authored by Mantz, Steve Allen of KIPAC at Stanford andHarald Ebeling of the Institute for Astronomy in Hawaii.